Everything you ever wanted to know about tart cups. At the time of this writing, there are no less than 16 different forms you can order a Sierra Mountain candle in. You can see a photo of all of them on our candle line up post. By far, the one that we get asked about the most is the tart cup. So, just what is a tart cup, and why in the world would you want one? A tart cup is a small sample of wax (a little over an ounce) in a simple plastic cup that you can find in most grocery stores. There is no label or fancy packaging. We simply hand write the name of fragrance on the lid. So, why do we make tart cups? There are couple reasons. First, we hate waste. During the candle making process, we often wind up with some extra scented wax. 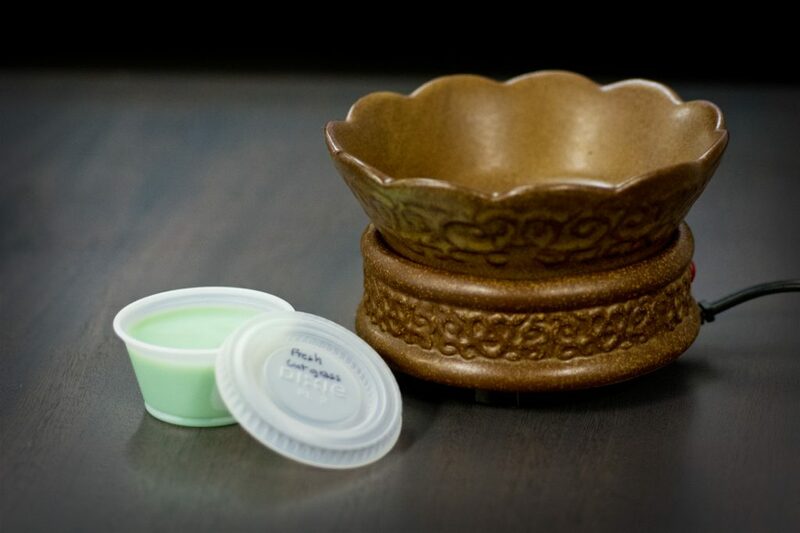 Rather than throw that wax out, we use it to make tart cups. Second, they make excellent samples. If you are thinking about ordering a candle, but you’re not sure if you will like it, you can order a tart cup first. Tart cups are very inexpensive, and since they are so small and light, they don’t cost very much to ship either. This makes them a great way to try a few scents to decide if you might like them before you invest in a full candle. Tart cups work great with candle warmers. Pictured here is our Ceramic Warmer Dish in Rustic Brown. What are tart cups good for? 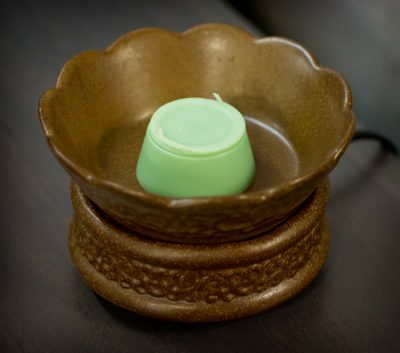 In addition to being a great way to test out fragrances, tart cups are actually prefect for use with candle warmers. We use them everyday at our shop, and they are strong enough to fill the room with fragrance. At this point, you might be thinking: what about melter cubes? Melter cubes are another form that you can order your candle in, and they are made exclusively for candle warmers. Melter cubes are a great way to fragrance a room without an open flame. Presentation. Melter cubes are a beautifully packaged finished product. They have our fragrance labels on them, and they make great gifts for candle lovers. Tart cups, on the other hand, are very simple with just the name of the fragrance hand written on the lid. While the fragrance is the same, a tart cup has a much more utilitarian presentation. Wax. 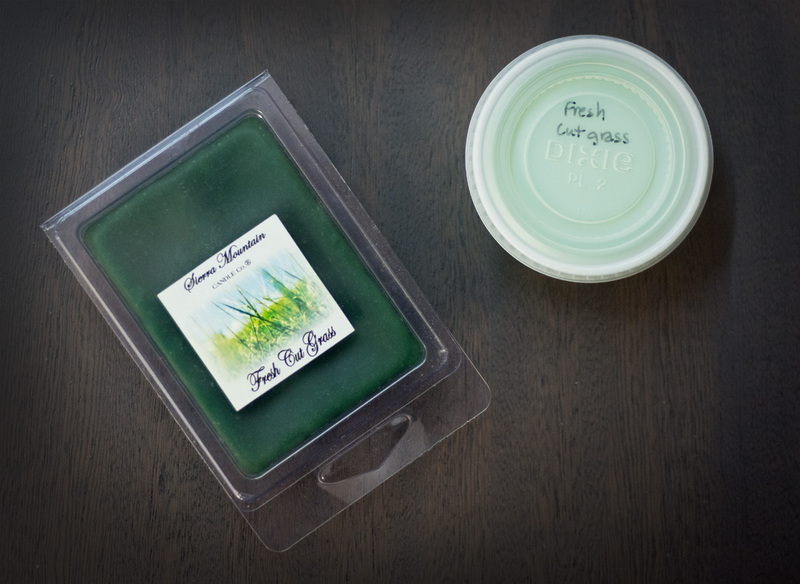 We use a different, harder wax in melter cubes to make it easy to break off just one cube at a time into your warmer. In contrast, tart cups are made with the same signature wax blend that we use in all of our scented jar candles. The melter cube wax is still an excellent wax, but it is good to know the difference. Quantity. Melter cubes come in trays of 6 cubes while tart cups offer only a single compartment with a little over 1oz of wax. Melter cubes offer quite a bit more overall melt time than a single tart cup. Now you know just about all there is to know about tart cups. So, why not order a handful to explore some new fragrances. Or, if you have a candle warmer, leave us a note with your next candle order saying you would like a free tart cup. If we have any extra on hand, we’ll throw one in for you.